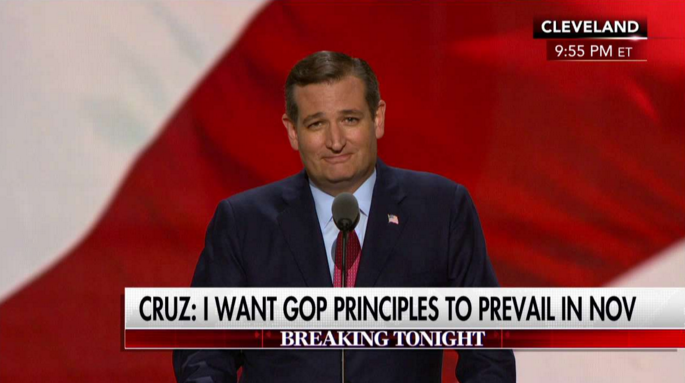 Former Republican presidential candidate Texas Sen. Ted Cruz addressed the RNC in Cleveland, Ohio, Wednesday night. To the disappointment of many, Cruz did not endorse his former rival Donald Trump for the presidency. Instead, he asked that Americans vote in November according to their "conscience." "We’re fighting, not for one particular candidate or one campaign, but because each of us wants to be able to tell our kids and grandkids ... that we did our best for their future and for our country,” he said. “God bless each and every one of you and God bless the United States of America,” said Cruz, drawing his speech at the Quicken Loans Arena to a close. The Texas senator was booed off stage after finishing his speech without endorsing the official Republican presidential nominee. Many speculate that Cruz is setting himself up for a presidential run in 2020. Check out a clip from his speech below.